We invest in attractively priced global exploration and production assets, and deploy our oil-well production optimization and exploration technologies to unlock asset values. I-Pulse is working with industry veterans with deep experience in building and managing oil producing companies, to make direct investments in attractively priced global exploration and production assets. We then leverage our suite of proprietary exploration and production technologies that deploy high-pulse power to unlock value in these under-optimized oil and gas assets. I-Pulse’s proprietary technologies can be leveraged to accelerate exploration and enhance the production of oil wells. 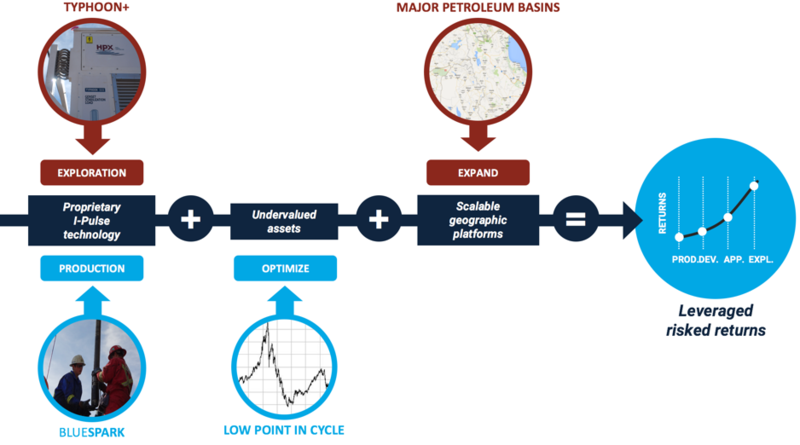 This technology makes High Power Petroleum (I-Pulse's subsidiary) a valued partner in the development of oil fields as it brings to bear a suite of capabilities that are unique and value additive to producing assets. High-pulse power electromagnetic surveying system detects hydrocarbons and sub-surface structures. We are partnered with Computational Geosciences Inc. to optimize survey design and processing to ensure that the predicted physical property models have the highest accuracy possible. When used in combination with seismic surveys, electromagnetic surveys improve prospect rankings and the chances of drilling success. 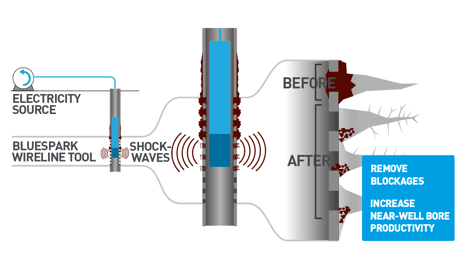 I-Pulse’s proprietary high-power near-wellbore stimulation tool can be deployed on a standard wireline, and in some cases without a workover of the oil well. Hundreds of wells have been treated to date with proven effectiveness in increasing production and reserves in sand-control and steam/water-flood reservoirs, as well as treating near-wellbore damage such as scale, wax and paraffins, and removing blockages created by fines migration. The company, through its subsidiary, High Power Petroleum (H2P), has identified Canada’s carbonate reservoirs as high potential candidates for production optimization incorporating I-Pulse’s Blue Spark near-wellbore stimulation tool. The combination of a targeted Blue Spark stimulation followed by an acid stimulation has shown multiple-fold production increases in existing applications. H2P has invested in LSE-listed Cabot Energy (formerly AIM-listed Northern Petroleum) to become its largest shareholder and strategic partner, forming a 50:50 joint venture across Alberta to pursue such production optimization opportunities. The initial project is on a 58,000-acre carbonate reef light-oil reservoir in northwest Alberta with 170 million barrels initially in place and 10,000 barrels of oil per day (bopd) production capacity. Recovery to date is 19%; however, with Blue Spark well stimulation and development drilling being deployed, H2P plans to increase the recovery factor up to 25%. A water-injection project and an additional reservoir unit development are being evaluated to further increase reserves, and reach the 10,000 bopd production target. As the largest shareholder in Cabot Energy (formerly Northern Petroleum), and its joint venture partner in the Adriatic offshore geological trend, H2P has direct, indirect and options in up to 65% interest in seven licences, which would result in H2P being the largest participant in this high-impact exploration area. These licences include a 27-million-barrel oil discovery and a 1 billion-barrel prospect being explored in 2017 via a 3D seismic acquisition with drilling scheduled in 2018. H2P has identified the geology of southeast Turkey as analogous to Northern Iraq with the potential for world-scale reservoirs. Operationally, however, the use of dynamite in seismic surveys is limited, resulting in reduced options for sub-surface surveying. 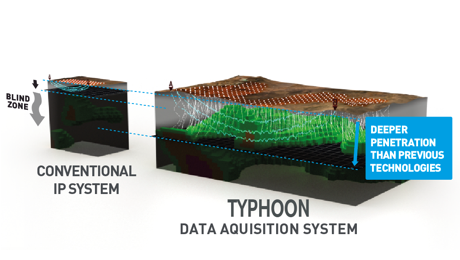 I-Pulse’s proprietary Typhoon high pulse-power electromagnetic surveying is a tool for direct hydrocarbon detection and/or subsurface mapping at depth. Typhoon represents an excellent tool to survey the subsurface in this high impact exploration region. H2P has become a shareholder and board member of leading Turkish explorer Aladdin Middle East, which has been operating in Turkey for almost 60 years. Aladdin discovered East Sadak, the first light-oil field in southeast Turkey in 2013, on trend with the world-scale Iraqi oilfields of Kirkuk, discoveries of Tawke in Northern Iraq, and Garzan in Turkey. As the largest shareholder in Cabot Energy (formerly Northern Petroleum), and its joint venture partner in the Otway basin onshore geological trend, H2P has direct, indirect and options in up to 65% interest in a 5,800km2 onshore shale-oil licence. The Otway basin is Australia's second most prospective oil and gas province. These licences are being evaluated for exploration via a 2D seismic acquisition in 2018 and drilling in 2019. Stay tuned for the website of High Power Petroleum, an I-Pulse subsidiary company.